"Not my eyes! Artoo, help! Quickly, Artoo. Oh! Ohhh! You beast!" 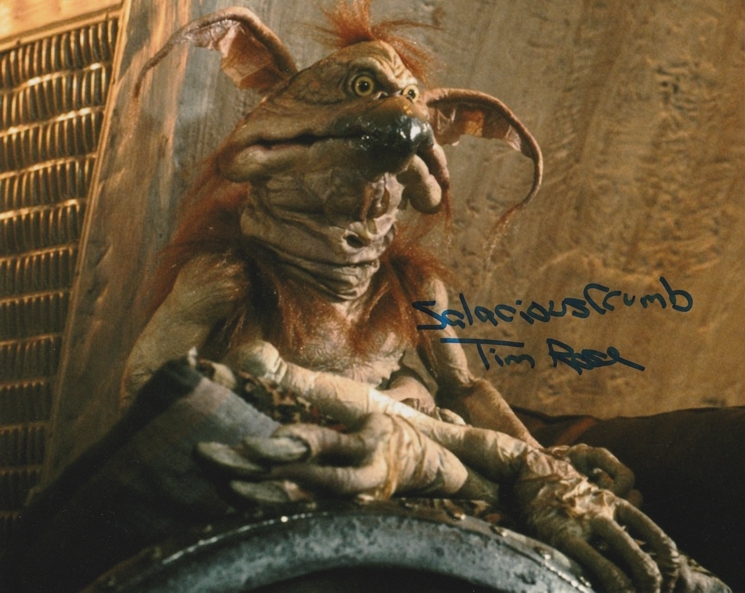 This great 8x10 of Salacious Crumb has been signed by Tim Rose who was a puppeteer in the original Star Wars trilogy. Rose also played Admiral Ackbar in Return of the Jedi. Salacious B. Crumb was a Kowakian monkey-lizard employed as a court jester for Hutt crime lord Jabba Desilijic Tiure. Known for his shrill laugh and sadistic sense of humor, Crumb started out as little more than vermin on Kwenn Space Station during the days of the Galactic Republic, eventually escaping onto a ship belonging to Jabba the Hutt. When Jabba found Crumb eating from his food bowl, he attempted to digest him, though the Kowakian monkey-lizard escaped, covering Jabba's two henchmen with goo in the process. Jabba found this extremely amusing, and offered Crumb a role as his court jester; if Salacious managed to amuse Jabba at least once a day, he would be allowed to eat and drink as much as he wished. However, if he failed to do so, he would be killed. For over a dozen years he lived in Jabba's Palace, playing many tricks and practical jokes on some of the palace's regulars, and becoming one of the most disliked members of Jabba's court. He died in 4 ABY, when Jabba's sail barge exploded over the Great Pit of Carkoon. The Star Wars films are a global success, having entertained generations of fans since the first installment hit cinema screens in 1977. This is a wonderful opportunity to bring the magic of George Lucas' far, far away galaxy into your own home. The force will be with you - always!